Do you ever have a moment when you hear the trivia question in each podcast and you just want to shout out the answer, right then and there inside your car? Or on the train? In the shower? Jeez — overshare. Well there is a venue for such vociferation: the Political Junkie roadshow. Slowly, but surely, we’re working our way across the country to let your trivia freak flag fly. New Hampshire is next. After that, Rochester (with the great enunciator, Neal Conan). Get your tickets now and prove your trivia know-how. Or you could just play along below. In this week’s podcast, we were inspired by former Vermont Senator Jim Jeffords, who passed away this week. His 2001 party switch moved a 50-50 Senate (with VP Cheney casting the tie-breaker) to one that became 50 Democrats, 49 Republicans and 1 independent. So the question is: Before Jeffords, when was the last time the Senate moved from more Republicans to more Democrats and NOT because of an election? Submit your answer in the box below. We’ll pick a winner at random from the bunch. The winner will get a fabulous, vintage Political Junkie button. Don’t forget, you can get the trivia question a whole day early by simply checking out our Political Junkie page on Facebook every Wednesday. You can sign up for our Political Junkie newsletter, too. You’ll get all the latest from Team PJ just once a week — no more, no less. Last week’s trivia question was: who was the last U.S. Senator from New York who hailed from Rochester? The question was obviously inspired by the fact that WXXI in Rochester, New York just signed on to run our hour program each week. 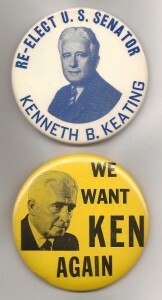 The answer is Kenneth Keating. He was a congressman from Rochester who was elected to the Senate in 1958 but lost his bid for re-election six years later to Robert Kennedy. Dan Shortridge of Dover, Delaware is this week’s randomly-selected winner. Congrats, Dan!